AutoCAD is one of the best CAD software for Windows, MacOS, and Android. So what will happen if you are a Linux users? You might be looking for a Free AutoCAD Alternative that suits your requirements. If so, then you are in luck today. Here in this review article, I am going to share a list of best free AutoCAD alternative for you as an ultimate Linux user. You already know about CAD software. But for the beginners, let’s start with a little overview. CAD is the Computer Aided Drafting or Computer Aided Design software. This technology is basically for engineers and architects for creating the designs for real objects around us like cars, buildings, bridges or any other mechanical or electronic product. But if you’re not an engineer or architecture, that doesn’t mean you can’t use it. Now, an AutoCAD alternative CAD software will have similarities with AutoCAD in file format support, designing procedures and tools. Let’s go through the article, and you’ll get your AutoCAD Alternative for Linux. Do you want to get a best and free CAD software but have no idea which one to choose as there are lots of options available out there? Just relax. Here, I’m going to share about 15 CAD software so that you can compare them and choose your Free AutoCAD Alternative for Linux system. Hope it helps you come up with a permanent solution to your problem. Let’s have a look. This list is not following any particular order instead of a generic list of few popular AutoCAD alternative for Linux enthusiast. Have you heard about Open Cascade? You can use Open Cascade as a Free AutoCAD Alternative. It’s an open source platform for software development. Open Cascade comes with a complete package of simulation software like CAD/CAE/CAM, PDM, GIS, and even AEC, different components for visualization, 3D surface and solid modeling, rapid application development, and data exchange. You can create both 2D and 3D models using modeling algorithms with this software. There is another AutoCAD Alternative for Linux, and that’s QCAD. QCAD is an open-source, free CAD software for 2D technical drawings. You can create and work on diagrams or schematics of mechanical parts, plans of buildings, and even the interior designs. With QCAD, you’re going to have modeling tools like Polylines and NURBS. Moreover, its Library browser comes with over 5000 CAD parts or free add-ons. It also provides an isometric view for more complicated work. If you want to customize your design, you can go back to the history anytime and change the designs with the parametric modeling. It also comes with a modular architecture, constraint solver, robot simulation, and a path module. As a Free AutoCAD Alternative, you can also use SolveSpace. SolveSpace is another open-source CAD software. You can work on both 2D and 3D modeling with SolveSpace. It’s a free parametric modeler with different modeling tools. SolveSpace comes with operations like revolves, extrudes, and Boolean for 3D modeling. Its constraint solver can smoothly simulate linkages in your design. Export triangle mesh, 2D vector art, or STL using different applications on SolveSpace. LibreCAD is a suitable open-source Free AutoCAD Alternative for beginners. It comes with all the important basic tools for you to create and customize 2D designs. Although it’s a CAD software for 2D modeling, it shows isometric views. LibreCAD can write DXF files and read files including DWG, and export PNG, JPG, PDF, SVG, and so on. If you need any support while using LibreCAD, it will always get your back with a huge committed community of developers, contributors, and users. BricsCAD is very similar to AutoCAD. That’s why it’s a great AutoCAD Alternative for Linux. You can always go with BricsCAD for your 2D drafting or 3D design modeling. It comes with three packages for it users. BricsCAD Classic provides with the software applications for 2D drafting. BricsCAD Pro and Platinum offer both 2D drawing and 3D modeling. Pro includes mechanical assembly viewing, render materials library, and HD rendering. Platinum comes with BIM ecosystem. Another Free AutoCAD Alternative for you is Varkon CAD system. It comes with applications for 2D drafting, 2D and 3D modeling, parametric modeling, and also visualizing. Varkon provides with features like geometric modeling, sculptured surface modeling, a standard library with more than 350 procedures and functions, easy integration, object-oriented database storage, OpenGL based rendering, and many more. It can import and export files with STL, PLT, IGES, and DXF formats. You can also use BRL-CAD as a Free AutoCAD Alternative. BRL-CAD is an open-source, cross-platform CAD software with high accuracy. It’s a constructive solid geometry modeling CAD software that comes with a whole bunch of tools and features. BRL-CAD offers ray-tracing with geometric analysis, geometry editing, tools for signal and image processing, external libraries for geometric representation, a benchmark suite for performance analysis, and framebuffer support. The next one is LeoCAD. It’s also a Free AutoCAD Alternative. 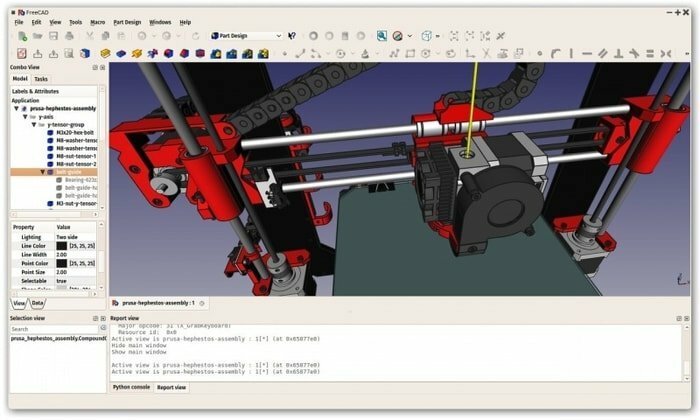 LeoCAD is free, open-source, and cross-platform software for CAD. You can create any design with it no matter how easy or complicated the design is. It’s straightforward and simple to use even for the beginners. LeoCAD is LDraw standard compatible, and its LDraw library comes with around ten thousand various parts. It can read and write MPD and LDR files and allows you to download and share files from the internet. Wings 3D is an easy, free, and powerful subdivision 2D/3D modeler. It can easily be your AutoCAD Alternative for Linux no matter if you’re a beginner. Wings 3D comes with a bunch of features like customizable interface, modeling tools, built-in AutoUV mapping facility, and material and lights support. You can also have tools like move, sweep, extrudes, scale, bend, inset, shear, plane cut, and so on. It supports STL, OBJ, XML, FBX, LWO, RWX, DAE, WRL, and 3DS file formats. Are you a user of both AutoCAD and Linux? You can switch to HeeksCAD as it’s a Free AutoCAD Alternative. HeeksCAD is a free, powerful, modular-free solid modeling CAD software. You can install additional plugins and extend it. HeeksCAD can import solid models from IGES and STEP files. It comes with the features including construction geometry drawing, sketch extruding, solids modification through Boolean operation or blending, language translation, and so on. 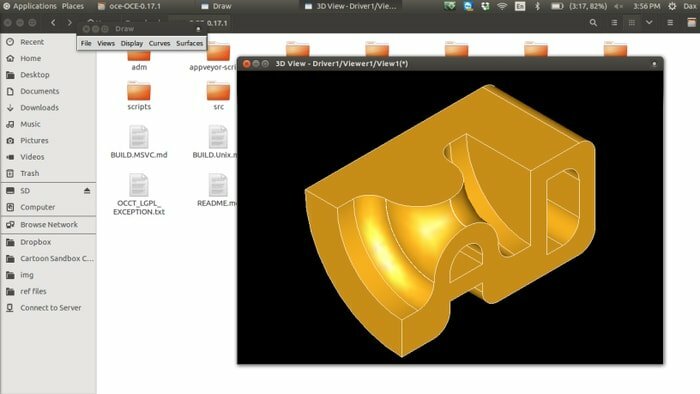 OpenSCAD is another Free AutoCAD Alternative for you. It’s a CAD software for 2D drafting and 3D modeling. OpenSCAD works with a textual description on the 2D compiler to create 3D models. Its features include Computational Geometry Algorithms Library and other external Libraries. To create a model of any object it requires commands or textual numbers/descriptions as the input on the user interface. OpenSCAD uses OpenGL and OpenCSG that lets you preview your model. 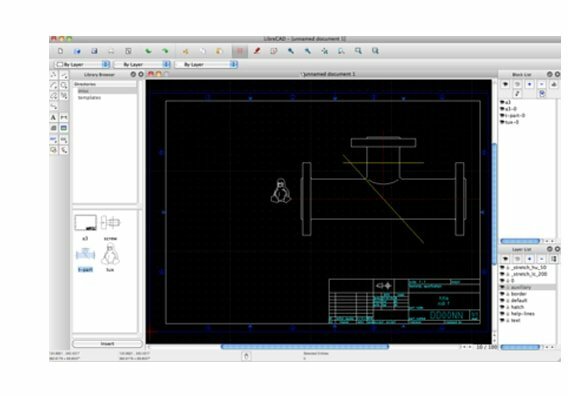 As an AutoCAD Alternative for Linux, you can try Antimony. It’s a free CAD software for parametric 3D modeling. If you’re a beginner, it will take more effort to go with this CAD. Antimony breaks down every single mesh into the least logical components, simple transformations, and shapes. That’s how you can create any complex object by merely adding or subtracting the components. Not happy with the given prefix string syntax shapes? You can define custom shapes. 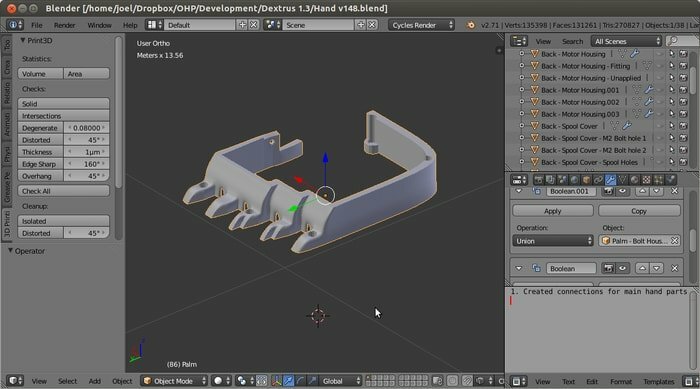 Blender is such an open-source 3D modeling software that you can use as a Free AutoCAD Alternative. Don’t confuse it with simple drawing software. It’s a professional CAD program for creating artistic 3D models, video games, animated films, other 3D applications, and also visual effects. Blender comes with a package of amazing features like 3D modeling, realistic rendering, skinning and rigging, texturing, smoke and fluid simulation, and graphics editing and compositing. Unlike any CAD software, ImplicitCAD is a math-inspired CAD software based on Haskell programming language. It’s a programmatic CAD software which uses descriptions of the object. Actually, objects are demonstrated in Constructive Solid Geometry or CSG, shells and bevels both in 2D and 3D. You can check it by download from the GitHub. CAD software is a very well-known and heavily used technology nowadays. It has a huge significance in our day to day life. It’s one of the core technologies for engineering and architecture fields. Not only that, people are using CAD for artistic design creation. There are a vast number of CAD software out there. But all of them are not free, or Linux supported. Before choosing a Free AutoCAD Alternative for Linux, go through the CAD information thoroughly and then decide. Don’t choose such an AutoCAD alternative that isn’t worth your time and skill. Is the article helpful? Is there any information missing? Please, let us know your opinion, experiences, and suggestions through comments in the comment section below. If you like it, please share it on social media and let others know about it. Free Autocad Alternative is the open source software I have been looking for, and I appreciate the software and the essay explaining the ways and usages for the 15 types. Opencascade is a library used by FreeCAD and probably solvespace, it should not be listed as an alternative as its the “core” with an API, nothing normal users can use.